To the ancient Egyptians, Horus was one of the most important deities. He was commonly depicted as a falcon-headed god with a double crown. The pharaohs of Egypt were associated with Horus since the pharaoh was considered to be the earthly embodiment of the god. 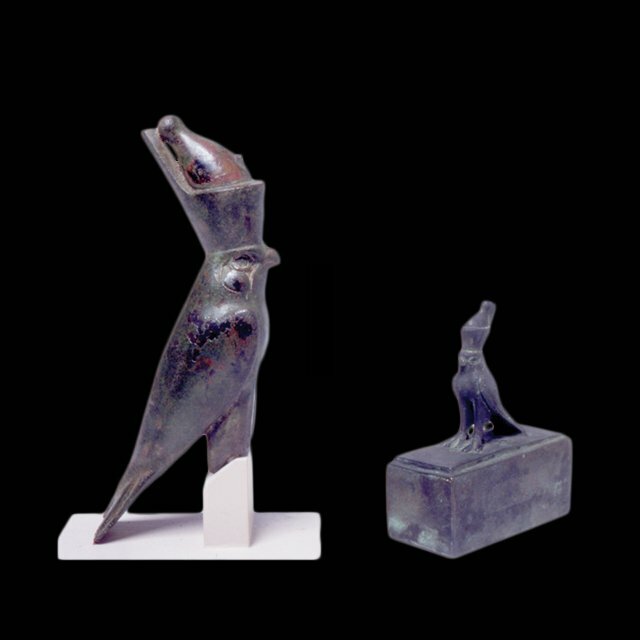 In the beginning stages of the ancient Egyptian religion, Horus was believed to be the god of war and the sky, and was married to the goddess Hathor. As the religion progressed, Horus was seen as the son of Osiris and Isis, as well as the opponent of Seth. This change in belief created the myth about Horus and Seth in which Seth was jealous of Osiris (his brother and king of the deities) because he himself wanted to be king. He murdered Osiris and split the body into pieces, which he scattered throughout Egypt. Isis, wife and sister of Osiris, searched and collected the pieces of her husband with the help of her sister, Nephthys. Isis brought Osiris back to life and he became the lord of the underworld and lord of the sacred land. Isis then gave birth to their son, Horus, and kept him hidden so he could one day defeat Seth. Once older, Horus claimed his right to the throne and battled Seth. Horus eventually won and became king; however, during battle, Seth damaged Horus’s eye, dividing it into six pieces. Thoth restored the eye, thus creating the Eye of Horus or Wadjat. The six pieces represent a series of fractions and the six senses, which included thought as a sense. Image: RC 7 Falcon Coffins at the Rosicrucian Egyptian Museum.